Mongolia is a landlocked country located between China and Russia. It is a vast emptiness that links land and sky, and is one of the last few places on the planet where nomadic life is still a living tradition. Mongolia may have various geopolitical, cultural and geographical meanings. Mongolia consists of historic Outer Mongolia. The province of Inner Mongolia is geographically and politically separate and located in northern part of China, yet it borders Mongolia. With only 1.7 people per km², Mongolia has the lowest population density among all independent countries in the world, and it is this vast and majestic emptiness that is the country's enduring appeal, bringing the traveller, as it does, into a close communion with nature and its nomadic inhabitants. Mongolia is known as the "Land of Blue Skies," and with good reason: there are about 250 sunny days throughout each year, so good sunglasses are necessary. The weather is bitterly cold during the winter, dropping down to -30º C in some parts. The weather during the summer varies from aimag to aimag, but it is generally hot. Outside of the Gobi desert, this time of year is marked with rains in some areas and cold nights. Although most travellers choose to come to Mongolia between May and September, with the highest tourist peak in July during the Naadam holiday, other seasons can also be excellent for travelling. For the culture and the beauty of nature without crowds, shoulder seasons from March to May and September to November are best. October is a very good time to visit, and November is not too late to travel to Mongolia. It is still warm during the days but chilly at nights. For visitors not afraid of cold, travelling to Mongolia from November till the Lunar New Year is still an option. Winter tourism is a developing area of the Mongolian tourism industry. The most rewarding experience will be visiting the nomads, and observing singing, dancing, wrestling and winter horse racing during "Tsagaan Sar", the traditional (Lunar) New Year celebration. The history of ancient Mongolia dates back to third century BC when the Xiongnu came to power among many other nomadic tribes. Due to illiteracy and nomadic lifestyle, little was recorded by Huns of themselves. They first appear in recorded Chinese history as "barbarians" against whom the walls were built. Those walls later became known as the Great Wall of China. There have been several empires in Mongolia after the Hun Nu. For example, the A Tureg Empire around 650AD, with its capital approximately 110km north of Har Horin (Kharkhorum). There was also the Uighur Empire, with its capital Har Bulgas (Khar Bulgas or Xar Bulgas) near Har Horin. The Khitans who controlled North China around 1000AD as the Liao Dynasty had an administrative center (Har Bukh) 120km to the northeast. The Government of Turkey has been promoting some Turkish Empire monuments and there is a museum of artifacts at the Bilge Khaan site. The struggle for mere existence and power over other tribes continued until the time of Genghis Khan. Chinggis Khan, as he is known in Mongolia, came to power and united the warring tribes under the Great Mongol Empire in 1206. He was proclaimed Genghis Khan (Chingis Haan), meaning ruler of all Mongol tribes. The Mongolian Empire was extended all the way to eastern Europe under Genghis Khan and to all of China and Central Asia, among other parts under his successors (including his grandson Kublai Khan), becoming the largest continuous empire in history with thirty-three million square kilometers (about thirteen million square miles) of extension. After years of hegemony and exercise of a great connection between Eastern and Western civilizations, the empire split into four kingdoms (or Khanates) through Eurasia, each of which lately achieved nearly total independence. The easternmost of these kingdoms was called the Yuan Dynasty and included Mongol native land and much of China. After times of dominance over China, the Mongols were driven back to the steppes by the Chinese Ming Dynasty under Emperor Hongwu. They were later conquered by the Manchurian-Chinese Emperors Kangxi and Qianlong of the Qing Dynasty. The Secret History of the Mongols is one of the great recordings of Mongolian history. Every Mongolian reads the book in the modern Mongolian language. This is one of the the oldest books in the Mongolian language. There are vivid similarities with the Bible in literary style, wording and storytelling. It is speculated that the author could have been a Christian or at least was very knowledgeable about the Bible. According to Hugh Kemp, Qadag (pp 85-90, Steppe by Step) is the most likely candidate for authorship of Secret History of the Mongols. He writes about the history of ancient Mongolia and connects the modern reality with the ancient world. Even though the book is about the history of Christianity in Mongolia, it paints a view of ancient Mongolia from the height of 21st century. The "History of Mongolia" by B. Baabar is a good source for the Modern History of Mongolia. Mongolia is more than twice as big as Texas and nearly the same size as Alaska. Its area is 1.6 million km² (603,000 mi²), four times the size of Japan and almost double that of Eastern Europe. This makes Mongolia the sixth-largest country in Asia and 19th in the world, but the population is only three million, which makes Mongolia one of the least-densely populated areas in Asia. 40% of the population lives in the capital city of Ulan Bator or Ulaanbaatar leaving much room for travel. Of course, Gobi is even less densely populated. Almost another 40% of population are scattered throughout Mongolia with their 56 million head of sheep, goats, cattle, horses and camels. There are 21 provinces, called aimag. Each aimag has a central city or town and about 15-22 sub-provinces called soum. 70% of Mongolia is under the age of 35 and the genders are pretty well balanced. 84% are Khalkha Mongols, 6% Kazakhs and 10% other groups. 90% of Mongols follow a mixture of Tibetan Buddhism and shamanism while the remaining 10% follow a diverse range of different faiths, mainly Islam and Christianity. Mongolia is home to the "three manly sports": wrestling, horse racing, and archery, and these three sporting events take place annually at the Naadam festival. Naadam is the National Holiday of Mongolia celebrated on 11-13 Jul. During these days all of Mongolia watches or listens to the whole event which takes place in the capital city of Ulaanbaatar through Mongolia's National Television and Radio. Many other smaller Naadam festivals take place in different aimags (provinces) around the country throughout the month of July, and these Naadam festivals provide a closer look at the action. It is believed that Naadam celebrations started with the rise of the Great Mongolian Empire as Chinggis (also known as Genghis) Khan's strategy to keep his warriors fit. After the fall of the empire, the contests were held during religious festivals, and since the communist revolution it was celebrated on its anniversary. The legend says that in old times a woman dressed like a man won a wrestling competition once. That is why open chest and long sleeve wrestling costumes, called "zodog", are meant to show that every participant is male. Wrestlers wear short trunks, "shuudag", and Mongolian boots, "gutal". The yellow stripes on the tails of wrestlers' hats indicate the number of times the wrestler was a champion in Naadam. Only Naadam gives official titles to the wrestlers. Mongolian wrestling tournaments have nine or ten rounds depending on the number (512 or 1024) wrestlers registered for the competition that year. If the wrestler wins five rounds, he will be awarded the title "Nachin" (bird), six rounds - Hartsaga (hawk), seven rounds - Zaan (elephant), eight rounds - Garuda (Eagle), nine rounds - Arslan (lion) and ten - Avarga (Titan). In 2006, Zaan (Elephant) Sumyabazar won nine rounds, making him Garuda, but that year 1024 wrestlers had ten rounds, each of which he won. This entitled him to Avarga. Or Arslan (Lion) must win two consecutive championships to become Avarga (Titan). The titles are for life. If Avarga (Titan) keeps winning at Naadam more and more attributes will be added to his title. There are no weight categories in Mongolian Wrestling tournaments but there is a time limit of 30 min, if the wrestlers can not overthrow each other, referees use lots for better position which often settles the match. One who falls or his body touches the ground loses the match. Mongolian Wrestling matches are attended by seconds whose role is to assist their wrestlers in all matters and to encourage them to win by spanking on their buttocks. They also sing praise songs and titles to the leading wrestlers of both wings, west and east, after the fifth and seventh rounds. The referees monitor the rules but the people and the fans are the final judges. They will speak and spread the word of mouth about who is who till the next year. The Golden Eagle Festival in Ölgii on the first weekend of October is the largest gathering in the world of eagle hunters. The event typically has 60 to 70 Kazakh eagle hunters displaying their skills. The events include having their golden eagles fly to them on command and catching a fox fur being pulled by a horse from a perch on a nearby mountain. 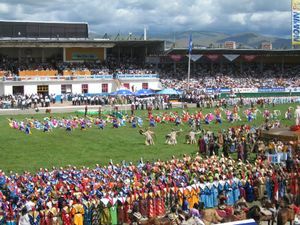 The event also features traditional Kazakh games like Kokpar (tug-of-war over a goat carcass while on horseback), Tiyn Teru (a timed race to pick up a coin on the ground while on horseback), and Kyz Kuar ("girl chase," is a race between a man and woman where the woman whips the man while he tries to hold on). The festival also has a traditional Kazakh concert, camel race, and displays of Kazakh art. A smaller eagle festival is held on 22 Sep in the nearby village of Sagsai. Nauryz Festival, also in Ölgii, is the traditional new year's celebration of Kazakhs held on 22 March. There is a parade, concert, and horse races during several days of celebration. Though most of the celebration involves visiting friends and relatives to eat Nauryz Koje (soup) and boiled mutton and horse meat. The camel festival is an annual celebration held in the southern Gobi organised by a local NGO to help protect the Bactrian camel and the essential role it plays in the lives of the nomadic herders in the region. Highlights include camel races, camel polo competitions and traditional performances of Mongolian music and dance. Those who want to will be able to travel to the festival by camel, dressed in their Mongolian best including a traditional deel. Altai Tavan Bogd National Park - home to the highest mountains and largest glacier in Mongolia, as well as Kazakh eagle hunters. Uvs Nuur Lake, Uvs province - The largest lake in Mongolia and a world heritage site. The River Tuul Nomad's Sacred Valley - The river Tuul is one of the longest rivers of the country, flowing from the Khentii Mountain Range. The valley of the river has been called sacred for centuries by the nomads as they respect nature especially the rivers and the surface water. Chinggis Tourist Base Camp  - located on the eastern fringe of the Gorkhi/Terelj National Park, on the bank of Tuul river. Xar Xorin (Kharkorum) - The capital of the Mongolian Empire after Ghenggis Khan. Khovsgol Lake, Khatgal - A large alpine lake. There are four border crossings open to foreigners, three on the Russian border of which the main one is Altanbulag, and at Zamyn-Üüd near the small town of Erlian on the border with China. For up to 90 days: Belarus, Brazil, Georgia, Kazakhstan, Kyrgyzstan, Macau SAR, Serbia, Ukraine and the United States. Ukrainian citizens need an official or private invitation to qualify for visa-free entry. For other foreign nationals, the process for obtaining a thirty-day visa (or tourist visa) requires a visa application form, a small fee at a local Mongolian embassy, a passport-sized photo and flight / train and accommodation bookings, or an invitation letter that is arranged through tour companies. However, the citizens of Indonesia, Russia, China and Taiwan and some other countries need to obtain an official invitation letter that is issued by the Consular Department of the Ministry of Foreign Affairs after confirmation by the tour company or firm or individual who is inviting them. Longer visas are available; it requires an invitation letter from a Mongolian company or individual. Citizens of countries where a Mongolian Embassy or Honorary consulate of Mongolia doesn't exist can apply for a Mongolian visa at the Mongolian borders - Chinggis Khaan Airport, Zamyn - Uud and Altanbulag. It requires an official permission letter that is issued by Immigration Office in Ulaanbaatar according to the inviting person or entity's request, exact arrival date and time, flight or train number. Once the permit is obtained, a copy of it, a passport-sized photo and visa fee of c. US$105 per applicant must be brought and then a visa will be provided at the airport. For most cases, it is easy to seek help from licensed travel company that can get permission from the Immigration Office in Ulaanbaatar. Also, it is possible to acquire an expedited visa in a matter of hours at the Mongolian consulate in Erlian, though there is a $50 US fee for this service. A similar service is available in the Mongolian consulate in the Russian cities of Irkutsk and Ulan-Ude. Indian nationals are required to apply for a visa, although the visa fee is waived. Tourist visas are valid for only thirty days. In Mongolia, they can be extended for a maximum of thirty days. The Embassy of Mongolia in the UK website is useful for updates. The Embassy of Mongolia in China website allows the printing of the application form needed to apply for a Mongolian visa while in China, although the consulate also has them. To stay more than 30 days, one must register at Mongolia Immigration. As of September 2013, the consulate in Irkutsk no longer requires an invitation letter and will issue even one-year multiple entry visas without a fuss. There are almost daily flights from Seoul on Korean Air as well as other flights through Beijing. There are also direct flights from Istanbul with Turkish Airlines. Don't buy a non-refundable or unchangeable ticket when travelling to Mongolia, because flights may be cancelled. The cheapest air tickets to Mongolia are provided by travel agents. Hunnu Air, a Mongolian Airline, offers flights from Hong Kong and Bangkok to Ulaanbaatar. When in the country it is possible to fly to all the provincial capitals. Plane flights between the capitals may be hard to find though. But travel agents, guest houses, and hotels can assist in obtaining a domestic air ticket. On of 24th September 2014 MIAT started relatively cheap flights from Singapore to Ulan Bator twice weekly (Wednesdays and Saturday). The Trans-Mongolian Line of the legendary Trans-Siberian Railway links Mongolia's capital Ulaanbaatar with Moscow and Vladivostok, Russia and Beijing, China. Every Wednesday train number K3 and every Saturday train number K23 (the legendary Trans Mongolian train) runs to Ulaanbataar, but a ticket only for Erlian (the border town) costs 130RMB for a hard sleeper, this is cheaper than an uncomfortable overnight bus from Beijing. The train leaves at 11:22AM from Beijing and arrive at Erlian (Erenhot) at 21:48. Stay overnight in one of the cheap hotels in Erlian around train station (double bed with bathroom from 60 RMB). The next day, pick up one of the old jeeps from the main park (50-70 RMB) or there is local bus from the bus station which runs between Erlian and Zamiid Uud, this bus has a clear sign on the front Mongolia and leaves when full (40RMB). The bus and the jeep transport passengers to the train station in Zamiid Uud. There is a nightly local overnight train from Zamiid Uud to Ulaanbataar at 18:15. A comfortable first-class bed (soft sleeper) costs 33950 MNT (four beds in closed compartment, ask for the bottom bunk) and second class (hard sleeper) costs 24000 MNT. There is a cheap, hard-seat option. The train arrives around 9.30am in Ulaanbataar. The Trans-Mongolian train crosses the Russia/Mongolia border at the town of Naushki, Russia. To save money, book one-way elektrichka (regional train) tickets from Irkutsk or Ulan Ude to Naushki. In Naushki, one can spend the night in the train-station resting rooms (komnati otdikha) for US$.50 per hour. From there, it is possible to take a marshrutka to the border-crossing town of Kyakhta, Russia. Walking across the border is prohibited, but travelers have no problems arranging for Mongolia-bound cars to take them across the border, either for a small fee or for free. Upon crossing into Mongolia, it is relatively easy to hitchhike or take a taxi or bus to Sukhbaator or UB, as all southbound traffic heads towards those cities. Second-class (hard sleeper) from Beijing to Ulaanbaatar is available and the ride takes almost 30 hours. The train leaves twice weekly from Beijing. Beijing to the border: If the Beijing - Ulaanbaatar train is sold out, as seems to be common, a more frequent option is to travel from Beijing to the border at Erlian by local train as described below, and then on to Ulaanbaatar by bus and train. eLong.com offers flights from Beijing to Erlian (Elianhaote on eLong). Trains run daily from Beijing to Jining (Inner Mongolia) or Hohhot, allowing switching to a train to the border town of Erlian near the Mongolian-Chinese border. The K89 leaves Beijing in the morning and arrives at Jining in the evening. Jining has many hotels near the train station and has karaoke bars. From Jining to Erlian there is a slow train that leaves in the morning, passes the Great Wall multiple times, and arrives in the early evening. For up-to-date train times and costs see China Guide. Note that this will take a night longer than getting the sleeper bus as described in "By Bus". Be wary of scams at the border where people in uniform will attempt to sell "required travel insurance." There is no such thing and they can safely be ignored. Then cross the border from Erlian in China to Zamiin-Uud in Mongolia as described in Erlian to and from Mongolia. In Erlian the border can be crossed in a Jeep or the daily bus. In the bus station look for the international-ticket window. Once in Zamin-Uud, the only option is the train. Having crossed the border, it is necessary to get from Zamiin-Uud to Ulaanbaatar as described in Zamiin-Uud get in. This website here has a full write-up (including maps, times, specific details, etc.) of how to travel from Beijing to Mongolia. From Ulaanbaatar there are several options. Firstly, the international train. Tickets at the international-ticket office located across the street from the train station. The ticket office is on the second floor in the VIP lounge. The second option is to get on the Hohhot international train and transfer at Erlian or Jining (Inner Mongolia). The third option is to take the daily train to Zamiin-Uud, Mongolia at the border and take a bus or jeep to China, then proceed to the bus or train station in Erlian, China. Liuliqiao long-distance bus station (六里桥客运主枢纽 or lìu lǐ qiáo kè yùn zhǔ shū nǐu）, phone 010-83831716, address: A1, Liuliqiao Nan Li, Fengtai District. Departure at 16:30. These are supposed to run daily, but may not. Phone at 10:00 on the morning of departure to see if the bus is running and to reserve a place. From Hohhot by bus cost 88 RMB and takes 6 - 7 hrs. There are several daily buses. Once in Erlian, follow the Crossing the border and From the border to Ulaanbaatar steps above. When travelling at a busy time (i.e. 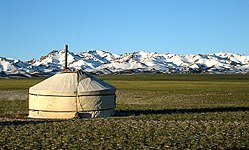 around Naadam on the 11th/12th July), to be sure of getting tickets for the last leg of the trip in Mongolia, take a package from a guesthouse in Beijing. They include will include a taxi to the coach station in Beijing, Beijing to Erlian by sleeper coach, a bed in the hotel in the bus station for a few hours, a bus from Erlian to Zamyn-Uud across the border, then soft sleeper overnight from Zamyn-Uud to Ulaanbaatar. Purchased separately, the tickets cost about 360 RMB. The Saga guesthouse in Beijing sells these, and although they insist 'til they're blue in the face the train is hard sleeper, it's actually soft sleeper! A daily bus goes from Ulan-Ude to Ulanbaatar. The ticket costs 1500 Roubles (as of July 2015) but it is better to let a tour company purchase the ticket. The tickets bear the passenger's name and passport number and therefore may be used for visa purposes as well. The companies charge 1700 to 1900 Roubles per ticket. The bus leaves at 7:30 AM from South Bus Station in Ulan Ude and reaches Ulanbaatar at about 10:00 PM, depending on the time taken at border. It drops passengers at Dragon Bus Station. Window seats have a view of the beautiful scenery. The road stops at the border town of Zamyn-Uud and gives way to an open desert, with tracks going in various directions but generally heading north toward the capital city. Hitchhiking in Mongolia is not easy and a little bit of money can be expected. There is an average of one car every hour heading into the desert. Expect a bumpy road with little to see other than the Mongolian steppe. To travel around the countryside without a guide, take a GPS and get some maps. The "Mongolia Road Atlas" is available in many bookstores, it is over 60 pages and covers the whole country: note there is a Latin-character version and Cyrillic-character version, in the countryside most people won't understand the Latin version. More detailed maps are available at the Mongolian Government Map Store. These maps are 1:500,000. Also, some other special-purpose maps and a good map of downtown Ulaanbaatar. The map store is on Ih Toiruu St. Go west from the State Department store on the main street, called Peace Avenue, two blocks to the large intersection with traffic lights, turn right (North) and the map store is about half way along the block. There is an Elba electronic-appliance store set back from the street, a yellow and blue building, the next building is a large Russian-style office building four floors high, the map-store entrance is on the west side, toward the south end of the building, it lines up with the North wall of the Elba building. Whichever method of long-distance travel is chosen, keep in mind that everything in Mongolia has a tendency to break down. Don't be shocked if part of the suspension breaks and the driver jimmy-rigs a carved wooden block in the place of a mount. For more serious breakdowns, it can easily take an entire day or longer for somebody to come along and help, so leave plenty of slack in itineraries. Finally, Mongolians are rather notorious for being late. A bus that is scheduled to leave at 08:00 will probably not be out of the city till almost 11:00. There are domestic flights between the capital and aimag capitals. The domestic airlines are Aero Mongolia, Eznis Airways, and Hunnu Air. All websites have online-booking systems but Aero Mongolia does not accept last names shorter than three letters. Hunnu Air's online booking system can process for sure. Travel agents also book domestic tickets. Traveling by car in Mongolia is a fun and independent way to discover the country, except in Ulaanbaatar, where traffic is usually at a stand-still. Although road accidents in the countryside are frequent, there are not many cars outside of the capital, and by using common sense and driving defensively, traveling by vehicle is relatively safe. Mongolia has a small, but a rapidly growing paved-road network, mainly connecting Ulaanbaatar with other provincial centers. 4x4 vehicles are often necessary to reach remote locations, even though locals use small city cars to drive across the country. For the budget conscious, Russian Jeeps and 4WD mini-buses act as a public transport system. About 100,000 tugrik pays for the all-day trip from UB to Tsetserleg (the regional capital of Arkhangai). Note that this involves being crammed into a vehicle with about nine locals (some of whom may be drunk) and spending the entire day racing over bumpy dirt trails. To rent a vehicle, Mongolia Car Tel. +976 9570 5709 provides off-road prepared Russian jeeps for rental from $65 per day, and Jeep Wranglers from $125 per day. They provide drivers for $20 per day. If driving a car in the countryside, avoid driving at night, be well-oriented, and have a working GPS and a pre-loaded map in a phone. Filling stations are infrequent, sometimes 200 miles apart, so fill up at each one. In case of breakdowns and punctures, locals are usually friendly and helpful, but in remote areas it may be a while until another vehicle passes. The above statement about road safety in Mongolia may not favour the use of motorcycles, but the view of open steppes, freedom and Mongolian hospitality make the country an excellent motorcycle destination. Motorbikes are rented for as little as 13 Euros per day in Ulaanbaatar. Alternatively, there are buy/sell-back arrangements with motorbike sellers of Chinese motorbikes at motorbike markets like the Black Market that are often cheaper than renting when it is for one or two weeks. Plus, it will be a new bike as opposed to the often run-down rental bikes. New Chinese Mustang bikes sell for 725 USD and can be sold back for about 2/3 the original price, depending on one's negotiating skills. Motorbike registration is a must and must be done by a Mongolian or a person holding a visa of 90 days or longer. Local buses tend only to connect the provincial capital with UB, and it is difficult to find any public transportation linking one provincial capital with another. Lately the bus situation has improved. Most cities and towns are known by their names or the name of the Aimag (province) or Sum (county), e.g. Dornod or Dornod Aimag or Choybalsan (the actual city name). Most buses have their destination on a card in the front window. Show the name written in Mongolian Cyrillic to the drivers or helpers and they will indicate the right bus. There are two types of buses, micro-vans and large buses (some large buses are old Russian types and some are modern and western), depending on the road. The large buses run on schedule, but the micro-buses are more lax. In Ulaanbaatar, there are two bus stations, one on the west near the Dragon Shopping Center and one on the East near the Botanical Gardens. Ask a local to write directions. Buy tickets for large buses the day before. In the Aimag centres, there will be service to Ulaanbaatar and to local suems (small county seats) and usually the next Aimag center. However, not all locations are available from any single location. Ask for help from the locals. 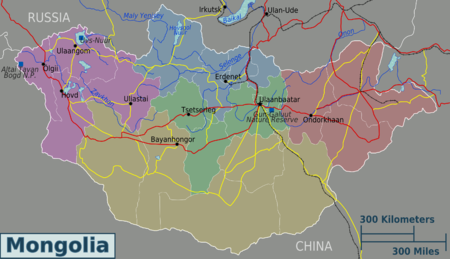 For example, In Ondorkhaan, the capital of Khentii Province, there is bus service between Ondorkhaan and UB from a central bus station, however the through-buses going to/from UB to Dornad and Sukhbaatar Aimags (Choybalsan and Baruun-Urt) stop at a gas station on the North side of the city. Purchase tickets at the station, not in the coach. Don't expect any cashier, driver or conductor to speak anything but Mongolian and, possibly, Russian. It is not possible to pay by credit card. A passport is required to buy a ticket. If luggage exceeds the standard (written on the ticket) in weight or size, the conductor will charge a fee, but this can be negotiated. On some destinations, the driver and the conductor illegally add extra passengers and get the money for themselves. They might even try to fit three people into two seats, for instance. The ticket gives the right to a full seat, so protest. Coaches for different destinations have normally 20-40 passenger seats. The coach will usually stop for a quick lunch or dinner at a snack or canteen. There is only one railway company in Mongolia, owned by the Russian and Mongolian states. It is probably the best way to experience something of the communist time, even if it has evolved a bit since then. The railway network is poor, consisting mainly of the Irkutsk-Beijing Trans-Mongolian route with a six spurs. The rolling stock consist of 30–40-years-old Soviet cars. Trains are slow. They usually leave on time, and arrive on time or less than 20 minutes late. Don't expect to encounter any English-speaking staff. Conductors and cashiers speak only Mongolian, and perhaps some Russian. The local trains stop at many small stations in the countryside. For example, there is the town of Batsumber, located about 34km north of Ulaanbaatar (as the crow flies), longer on the train. Take camping gear and hike to the mountains about 10km east of the town. There are two streams flowing west out of the mountains, hike and camp along the streams. There is a small restaurant, and food shops in the town. See train timetable and ticket prices on the company website  (only in Mongolian). Mongolian trains are cheap, even in comparison with Russian and Chinese trains. A supplement is charged to book in advance and there is another fee for tickets purchased aboard the train, which is the only possibility left if there are less than ten minutes left before departure. A passport is required to buy a ticket. There are three classes: tasalgaat, untlagyn, and niytiyn, they directly correspond to the Russian train classes kupeyniy, platskartniy and obshchiy. Tasalgaat class is the only one with closed compartments, with four berths for each. There is a fee for compulsory bed sheets inside the train. Untlagyn cars have open compartments with six berths. Niytiyn class is the cheapest, but definitely not recommended. Nights are spent sitting and with little space on crowded days. The tickets are numbered, but, when the seats are exhausted, the company overbooks public seats with tickets numbered "0", at the same price. There is a small water boiler at the end of each train car which dispenses free hot water, so it's a good idea to stock up on instant noodles and tea for the trip. Drinks and Mongolian food are offered inside the train, both by official sellers of the company and, at the big stations with long stops, from private people getting in the train for that purpose. Guard belongings: theft is common, but there are policemen on each train. On a long trip, tickets will be checked repeatedly and passengers are even awakened in the middle of the night for that. Passengers are not awakened for any stop but the terminus, in which case they are awakened even more than one hour before arrival, depending on the agent. The train toilets officially close 30 min before the terminus, sometimes even earlier. Public countryside taxis and minivans offer more destinations than coaches and trains, especially between provinces. But they are more dangerous than coaches and trains. Most drivers don't respect the traffic rules. Countryside taxis and minivans leave when full. They always say they will go "now" ("odo") but it's rarely true and there are waiting times of hours, but the number of people already sitting inside the vehicle gives an idea of how long the wait will be. It is also possible to charter a Jeep and driver for private use. Prices are typically negotiated by the kilometre. While far more expensive than sharing a ride with the locals, this means of transport is considerably more convenient and offers access to remote sites. A guide can be hired for the length of the stay, allowing travel without worrying about taxi drivers who overcharge foreigners. To book a jeep with an English-speaking driver in advance, contact Traverse Mongolia tel. +976 9199 6099, prices are usually fixed at $55 per day plus fuel and meals for the driver (and accommodation, if an overnight trip), but are negotiable. In the cities, taxis should charge about MNT800/km. The drivers will set their trip meter and charge accordingly. For local travel, horse-back is a good option. Note, however, that Mongolians ride on wooden saddles, so it's probably a good idea to pick up a leather, Russian saddle in Ulaanbaatar. Another alternative is to walk. Since camping is possible anywhere, resting is never a problem. Wherever there is water, there are nomads, and along the major dirt roads there are plenty of guanz, who can provide huge cheap meals. Adopting the Mongolian style of sleeping outdoors is also an option - wrap up in wool blankets and then cover up with a Russian raincoat (essentially a tarp in the form of a trench coat), and simply plop down on the ground. One night sleeping this way gives a whole new appreciation for the wonders of sleeping bags and bivvy sacks/tents. With the exception of the westernmost province, where Kazakh is spoken, everyone in the country speaks Mongolian. The language is difficult for Westerners to learn and speak, even after multiple months of being immersed in the culture. Westerners typically require a minimum of 9-18 months of full-time study to be conversant. Most locals will appreciate attempts to speak phrases in Mongolian, although the traveller will inevitably pronounce them wrong (be careful when ordering water in a restaurant - the word for water [pronounced "oos"] is indistinguishable from that for "hair" to the English ear! Makes for a good laugh over and over ...). Picking up a phrasebook and practising a few phrases will help. The numbering system is regular, and fairly easy to learn. Despite the government's efforts to promote the Mongolian writing system, the Cyrillic alphabet still prevails and being able to read it is advantageous. Russian-speakers be able to communicate. Mongolia has had a long history of alliance with the Soviet Union, and Russia after the break up of the Soviet Union, so Russian is compulsory in all Mongolian schools and widely spoken in urban areas. English is not widely spoken, despite its recent popularity. Some older Mongolians speak German due to the country's ties to the G.D.R. that caused many Mongolians to work and study in East Berlin. Mongolia is a big country with bad transportation, so visiting too many provinces will require much time spent travelling. Hôvsgôl (or "Hövsgöl") lake, in Hövsgöl province, is beautiful and can easily be accessed from Khatgal. There is little architecture in Mongolia, but Amarbaysgalant monastery, Selenge province, in the middle of nowhere, is worth seeing. Erdenet's open copper mine, the biggest copper mine in Asia, is in Orhon province. The Trans-Mongolian Railway passes through the country. Local Bonda Lake Camp in Khatgal village near Lake Khovsgol offers fishing, hiking, winter tours, nomad visits, horseback riding, visiting reindeer herders and the Darhad Valley. Via horse, it is possible to visit beautiful Lake Khovsgol and meet Tsataan (nomadic reindeer herders) living in yurts in the north of Khovsgol area. This region is scenic, perched at 1645 m altitude in green mountains, covered with thick pine forests and lush meadows with grazing yaks and horses, and rich with wildlife: the lake has nine species of fish and its surroundings are full of sheep, goats, elk and more than 430 species of birds. Mongolia's Khalh, Darhad, Buriad, Hotgoid and Urianhai tribes live nearby. The camp has a hot shower, sauna, internet and a restaurant with Mongolian and European meals. Mongolia Incoming Tour Operator Samar Magic Tours (phone="976-99282459" url="http://www.samarmagictours.com/") offers custom-designed tours and expeditions for photography, historical and cultural visits, expeditions to the Land of Genghis Khan, spas and thermal hot springs, bird watching, botany, nature, the Gobi desert, fishing, Naadam Festival tours, private trips, horseback riding, camel riding, 4WD off-road tours, and luxury travel. The Mongolian currency is the tögrög (төгрөг), also spelled tugrik, tugrug or togrog, Unicode and local symbol: "₮", ISO symbol: MNT. There are around 2,600 tugrik for USD1 or MNT3,000 = EUR1. Mongolia is famous for its copper mines Erdenet and Oyu Tolgoi. Copper bookmarks are ideal souvenirs and this USD1 metal souvenir is sold in Ulaanbaatar souvenir shops. Paintings by local artists are excellent buys in Mongolia (local painting center gps coordinate: 47.928958, 106.928024 , "N+106°55'40.9"E/@47.9289438,106.9280278,15). Felt poker-work is sold in Erdenet. The huge open-air market, Narantuul ("The Black Market"), in Ulaanbaatar offers the lowest prices on just about anything. Beware of the many pickpockets and even attackers there. This can be a great place to get a good pair of riding boots. There is a variety of Mongolian styles, from fancy to the more practical, or even get a good set of Russian-style boots. In Erdenet is a ISO 9 001-certified carpet factory, also making and selling slippers made of carpet. The staple in rural Mongolia is mutton or sheep. Beef hits the menu occasionally. Here, about MNT8,000-10,000 will buy a large platter heaped with fried noodles and slivers of mutton. On the side will be a large bottle of ketchup. Khuushuur (huushoor) is a tasty, greasy, fried pancake stuffed with bits of mutton and onion. Three to four make a typical meal. Also, the ubiquitous buuz (booz) can be had at any canteen in town or the countryside. Buuz are similar to khuushuur in that they are big dumplings stuffed with mutton and onion, however they are steamed rather than fried. Six buuz cost MNT3,000-5,000 (USD1.50-USD2.00) and serve one. The boodog or goat/marmot barbecue, is particularly worth experiencing. For about MNT100,000-200,000, a nomad will head out with his gun, shoot a marmot, and then cook it using hot stones in its skin without a pot. Along the same lines as boodog is khorkhog (made of mutton), which is prepared by building a fire, tossing stones into the fire until they are red hot, placing water, hot stones, onions, potatoes, carrots, and, finally, mutton chops, into a large vacuum-sealed kettle; let the kettle simmer over a fire for 30-60 minutes; open it carefully, as the top will inevitably explode with hot juices flying out; once the kettle is opened, and all injuries have been tended to, eat the contents of the kettle, including the salty broth. This cooking method makes mutton taste tender and juicy, like slow-roasted turkey. Guides can arrange this dish in summer. The boodog is also made of other meat, usually goat, and is similar to the khorhog with one major difference: the meat, vegetables, water and stones are cooked inside the skin of the animal. They skin it carefully, and then tie shut the holes at the legs and back side, put the food and hot stones inside, tie the throat shut, and let it cook for about 30 minutes. The national drink is Airag. (It is available in for example in traditional mongolian "ger" tents in Ulan Bator at the main entrance of Gandantegchinlen Monastery, GPS decimal coordinates N47.92069 E106.89467 and at the West Market N47.91118 E106.83569). This is a summer drink made from fermented mare's milk, and is certainly an acquired taste. The alcohol content is less than that of beer, but can have noticeable effects. Those unaccustomed to drinking sour-milk products may have diarrhea; later the stomach becomes accustomed to it. This should only happen the first time though. There are numerous ways to describe the taste, from bile-like to a mixture of lemonade and sour cream. The texture can also be off-putting to some people since it can be slightly gritty. It is worth keeping in mind that Airag is milk and a source of nutrients. After a day of riding it can actually be quite refreshing, once acquiring a taste for it. Milk tea is the first thing served to guests in a ger; it is essentially a cup of boiled milk and water, sometimes with a couple pieces of tea leaf thrown in for good measure. A tolerance can be effected by drinking much milk before the stay because they don't drink much else, except perhaps boiled water if requested during a longer stay. Also, most traditional nomadic foods such as dried yogurt and the like require acclimatization to milk as well. Cold drinks don't actually exist in the countryside (except when drinking directly from a river, which is not recommended). Try home-made vodka. It's usually made from distilled yogurt or milk. It doesn't taste weird. The first shot has little impact, at first, but kicks in a few minutes later. Most people in Mongolia usually drink this for medical reasons. First, heat the vodka, then add a bit of special oil which is also made from milk. Overheating it causes blindness. Mongolians call their national vodka nermel areehk ("distilled vodka") or changa yum ("tight stuff"). There are many Russian-style vodkas sold all over the country. The best are Chinggis Khaan vodka, Soyombo and Golden Chinggis. Western beers, from Miller to Heineken can be found in Ulaanbaatar. They sell Budweiser -- not American Bud but the Czech Budweiser. Local beer, such as Chingiss, Gem Grand, Borgio or Sengur is fine. Western-style accommodations are available in Ulaanbaatar, but they go for western prices. There are a few nice guest houses in the capital for less than US$10 per night (even as cheap as 3,000 tugrik for those willing to share a room), but they are crowded during the tourist season and difficult to obtain. Apartment rentals on e.g. AirBnB are a better and more affordable option than hotels or guesthouses. Out in the countryside, most of the hotels are rundown leftovers from the Soviet era. A better option is tourist ger, set up by entrepreneurial locals. Staying at one of these costs about MNT10,000 per person per night. They often include breakfast and dinner. When staying in a guest ger, the usual gift-giving customs can be skipped. Although ger-camps are set up by tour companies, many are also rented to independent travellers. Unfortunately, they tend to be both expensive (>35 US$ per person per night with three meals) and out of the way. Except for the cities and larger towns, all of the land is publicly owned. This means a tent may be pitched pretty much anywhere. Courtesy dictates maintaining distance from existing nomad encampments. Common sense dictates not pitching a tent in the middle of or too close to a road. In Mongolia, nowadays there are more 300 hotels and these are graded between one and five stars. Hotels holding three or more stars are for tourist service. 3 – 5 star holders must obtain special permission in order to operate. “Accommodation grading committee” consisting of the Ministry, travel-industry associations and tourism researchers categorize accommodations according to Mongolian standards. Currently, there are four five-star hotels: Shangri-La Hotel, Best Western Premier Tuushin Hotel (located next to the Mongolian parliament building), Terelj Hotel (set in the natural environment of Terelj National Park, around 70km from Ulaanbaatar) and Ulaanbaatar Hotel and three four-star hotels: Chinggis, Kempinski Hotel Khan Palace (German-based Kempinski Hotels took over the management of Khan Palace, renaming it Kempinski Hotel Khan Palace. ), Ramada Hotel, and Bayangol Hotel. There are thirty three-star hotels and other hotels have one or two stars. Most hotels are on a bed-and-breakfast basis and have three types of rooms: deluxe, semiluxe, and standard. There are some language schools in the capital. The two best-known to foreigners are Bridge School and Friends School. Both schools offer group-study classes or individual tutors. The National University of Mongolia offers courses. It usually takes Westerners about 9 to 18 months to acquire good conversational abilities in Mongolian. Speakers of Turkic languages, such as Turks or Kazakhs, tend to grasp it more quickly due to the similarities in grammatical structure. There is demand for native English speakers as English teachers. Anyone who is interested in teaching English will have no trouble getting employment and a work visa through a school or organization. However, the pay is generally low compared to other countries. Though it'll usually be just enough for room and board plus a little extra. Volunteer work is available teaching English, assisting with charity work and joining archaeological digs. These jobs are easy to find and rewarding. Unfortunately, xenophobia is rampant, and violence towards foreigners is common. There are bands of Mongolian nationalists who style themselves as neo-Nazis and assault foreigners: be cautious. Especially in the capital, violent crime rates are among the highest in Asia. Alcoholism is a huge problem. Do not acknowledge or approach any Mongolian man under the influence of alcohol. Nearly all foreigners who go to bars / clubs at night report assault and general aggression. Violent crime is common outside the capital and caution is required at night. Dark or deserted alleys and streets, in particular, should be avoided. Apart from Ulaanbaatar, Mongolia is generally a safe place to travel. However, incidences of pick-pocketing and bag-slashing have risen in recent years, so always keep personal belongings in a safe place (money belts are highly recommended), especially in crowded areas or in places where one's attention is diverted, such as Internet cafes. Notorious places for theft are the Black Market (bazaar), the railway station and crowded bus stops. Be careful when travelling by horse, because groups follow tourists and then steal their goods, including the horses, while they sleep at night. Many tourists are injured from falling off of horses. Mongolian herders are expert riders, thus their idea of a horse suitable for riding is quite different from most casual riders. Also, the horses are trained differently than in the west. If injured in Mongolia, medical aid and ambulance service may be hundreds of kilometres away, hard to obtain and consist of a Russian minivan. Medical evacuation insurance is advisable. Mongolia has aggressive dogs which may run in packs. Be wary of them since they are not likely to be as tame as domestic dogs elsewhere and they may be rabid. Marmots should not be eaten at certain times of the year because they can carry pneumonia. That said, the disease is carried by the marmot's fleas, so the afflicted tend to be fur traders, and marmot is not a mainstream dish even in Mongolia. There are plenty of Internet cafés in the capital. The postal service is slow and most people have a PO Box if they want to get anything. It is possible to buy phone cards that can be used to call abroad very cheaply from domestic phones, but not all phones can do this. (Ask for MiCom or MobiCom cards). In the countryside, don't expect to stay in contact with anyone. Most Aimag centers (provincial capitals) have an Internet café in the post office. To make local calls in Ulaanbaatar, use a phone of one of the many entrepreneurs with cellular telephones on the street corners.